You may have noticed yesterday that Nathan Fillion tweeted a very dapper portrait of himself as Mal Reynolds from Firefly. 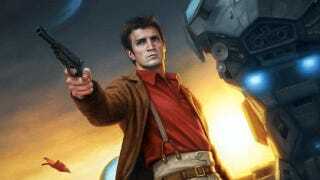 This artwork is by Dan Dos Santos, who immortalized the Browncoat for Dark Horse's upcoming Serenity comic for Free Comic Book Day. Dan took io9 through the process of drawing the most charming captain in the 'verse. A few months back, Dark Horse Editor Scott Allie and I were having a discussion over dinner, and it came up that I am a huge Firefly fan. He asked if I would be interested in doing some art for an upcoming comic featuring Captain Malcolm Reynolds, and I of course jumped at the opportunity. The first step in any commission is developing ideas. These ideas usually start off as really rough scribblings, and eventually develop into loose color sketches which I draw in Photoshop (seen below). When creating these sketches, I am taking special care to consider where the type will go over the image, and am sure to keep these areas relatively simple in design so they do not conflict with the predetermined layout. Because this image was to be used for a cover, as well as an ad, I had multiple type layouts to consider, as well as a specific color palette that I needed to stick to. These restrictions help narrow my options, giving me a good place to start, and a better idea of what compositions will successfully meet the client's needs. When I felt that I had 3 good options, all depicting Mal in different moods, I presented them to Scott for consideration. Having decided on Sketch #1, the next step is refining the chosen sketch. To do this, I acquire mass amounts of reference material to aid me in making my image more realistic. I began by taking a bunch of photos of myself dressed as Mal. Using a variety of random props I had laying around, I came up with decent costume that although is not refined, would give me the information I needed to paint a convincing image. I assumed a variety of poses, in different lighting set-ups, and shot several dozen pictures until I found something that I felt worked well. Since I would obviously be using Nathan Fillion's face, I was primarily concerned with the body pose. The next step was to seek out a good shot of Mal's face to put onto the body reference. To do this, I watched the entire Firefly series again, as well as Serenity, taking hundreds of screencaps whenever I saw a nice shot of Mal I thought I could use. I then went through all these faces, pasting them on to the body reference I shot with the help of Photoshop. Eventually, I found one that worked well. By combining screen captures, as well as custom reference, I can create a new image of Mal that is convincing, yet original. I used a fairly similar method for Serenity herself, combining an amalgam of screencaps and 3D models to create the pose I needed. Lastly, I give the painting a few days to dry, and then give it a coat of retouch varnish. The varnish adds a nice even sheen to the painting, and allows me to take good photographs of the painting for reproduction purposes. You can see more of Dan's art at his website. The Star Wars/Serenity Free Comic Book Day flip book by Zack Whedon comes out May 5, 2012.